Produce thumbnails the easy way, quickly and for free! 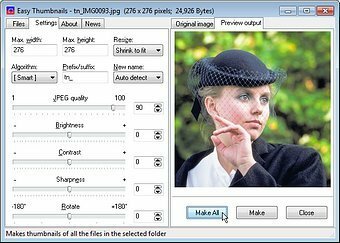 An elegant interface makes it a snap to find your images and select them for processing individually, in groups, or in whole folders, using a simple file selector and built-in image viewer. You can use slider controls to rotate images and adjust their contrast, brightness, sharpness and quality, and check out the results with the built-in viewer. 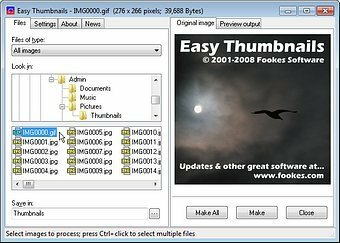 Thumbnails can be created in any existing folder or a new folder, and you can identify them clearly by adding a prefix or suffix to their filename. If you’re an image-processing enthusiast, you’ll enjoy having a choice of eleven resampling filters for the best possible results. You can convert small batches of images inside Windows Explorer from the File menu or with a right-click of the mouse, display thumbnails in your browser, and even take advantage of command-line switches to generate thumbnails seamlessly from other programs. You can also save your thumbnails to a Web page using a HTML template that you can easily customize to create your own layouts, and there’s helpful documentation that includes full instructions and some useful tips. Easy Thumbnails is 100% free. It won’t annoy you with ads, junkware or nag screens. It comes from the developers of the award-winning NoteTab text editors. 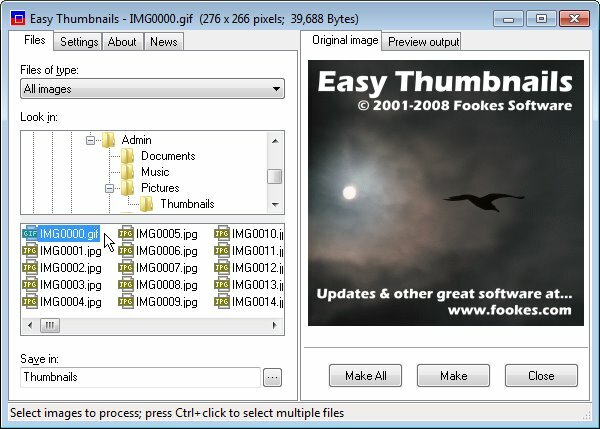 Easy Thumbnails is delivered in a quality installer that doesn’t make any irreversible changes to your system. You can easily uninstall it at any time by using Add/Remove Programs in the Windows Control Panel. Click on the download button to get the latest version of Easy Thumbnails.